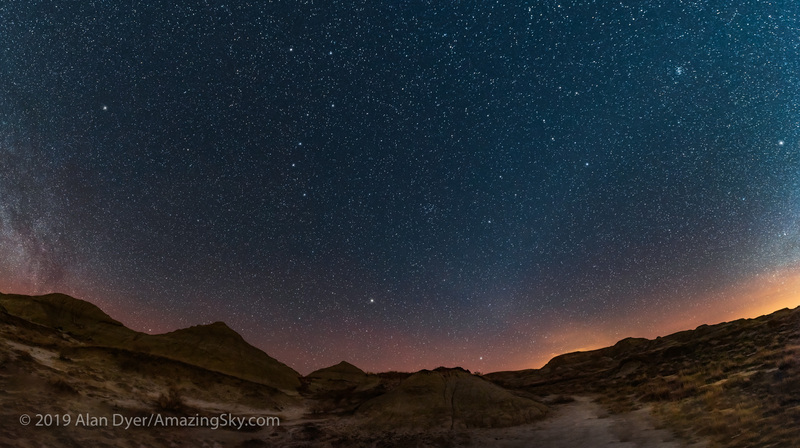 I present a sweeping panorama of the winter and spring stars on a February night. The lead image is a panorama I shot last Saturday, February 27 that takes in about 200° of sky from northeast to west, and nearly to the zenith. It encompasses most of the northern spring and winter stars and constellations. I’ve added the labels to help you pick out the celestial highlights. The winter sky, containing Orion as the central constellation, is at right setting into the west. This area of sky contains a rich collection of bright stars and identifiable constellations. The left side of the sky contains the spring constellations, now coming into view in the east. Note how that area of sky is sparsely populated by bright stars. You can see the Big Dipper, Regulus in Leo, and Arcturus rising at lower left. 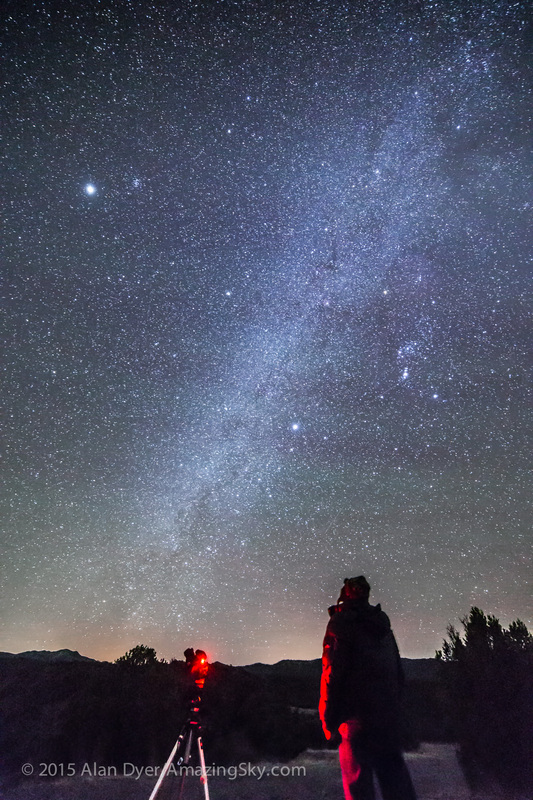 The reason for the difference is the Milky Way – you can see it at right arcing up from the southern horizon passing by Orion and through Gemini, Taurus and Auriga. In that direction we are looking into the outlying spirals arms of our galaxy, toward rich areas of star formation. To the east, at left, we are looking at right angles out of the plane of our spiral galaxy, toward the galactic North Pole, here just left of Leo. In that direction there are very few bright stars between us and the starless depths of intergalactic space. The spring sky is rather blank compared to the rich winter sky. But you can see Jupiter, the brightest object in view here, and now prominent in the evening sky. Note one other subtle glow just above Jupiter. That diffuse glow is the Gegenschein, caused by sunlight reflecting off interplanetary dust opposite the Sun in our solar system and in the plane of the ecliptic. Jupiter is just east (left) of the Gegenschein here, as Jupiter was then just over a week before its date of opposition, March 8. By then the Gegenschein will have moved to superimpose right over Jupiter, as both then lie opposite the Sun. I shot this scene from home on February 27, 2016, using the new iOptron iPano motorized “gigapan” unit, which I programmed to move and shoot 36 exposures with the Canon 5D MkII and 35mm lens, arranged in 4 rows high with 9 panels wide in each row from east to west. The result is a huge mosaic, 24,000 by 10,000 pixels. Each exposure was 25 seconds at f/2 and at ISO 3200. The camera was not tracking the sky. I stitched the 36 segments with PTGui using its Spherical Fisheye projection. The image has black margins but I think the circular format is more suggestive of the spherical dome of the sky above and around you. But that’s me, a longtime planetarium show producer. Next time I will shoot the zenith cap images as well! What a fabulous night! The desert sky was full of subtle glows and myriad stars. 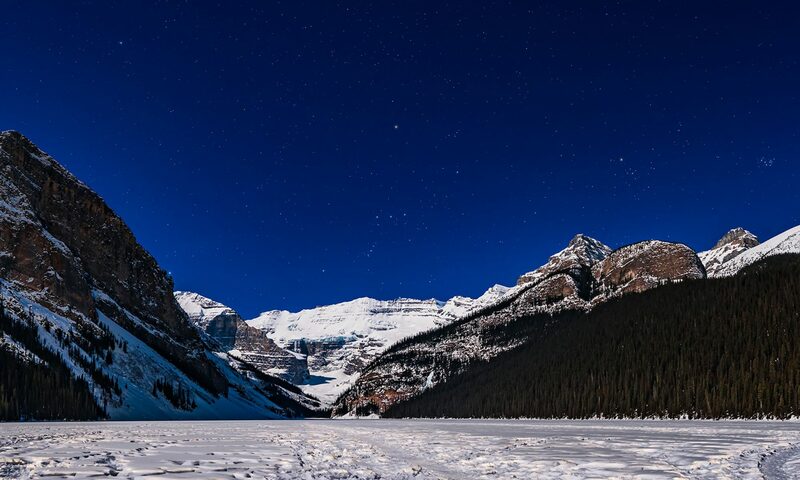 Friday, January 16 was a stunning evening for stargazing. 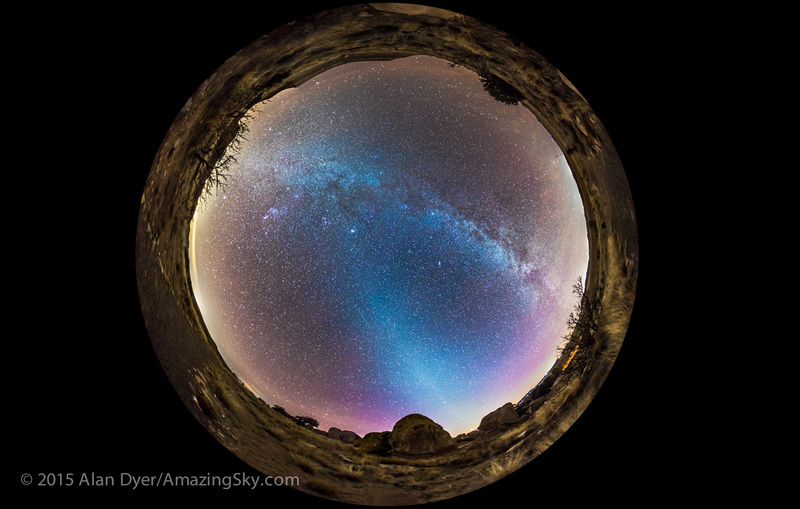 I took the opportunity to shoot a 360° panorama of the evening sky, recording a host of subtle glows. The Zodiacal Light reaches up from the western horizon and the last vestiges of evening twilight. This is the glow of sunlight reflecting off cometary dust particles in the inner solar system. From the clear desert skies it is brilliant. The dark of the Moon periods in January, February and March are the best times of the year to see the evening Zodiacal Light from the northern hemisphere. 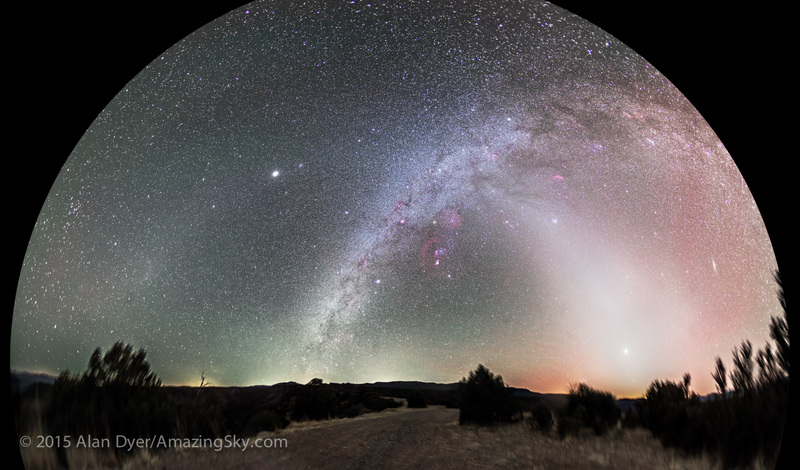 The Milky Way arches across the eastern sky from Cygnus to Canis Major. That’s light from billions of stars in our Galaxy. At centre, in the circular fish-eye image above, is the small wisp of green Comet Lovejoy, near the zenith overhead and appearing at the apex of the Zodiacal Light’s tapering pyramid of light. This view is from the same images used to create the circular all-sky scene at top, but projected in a rectangular 360° format. I shot 8 segments for the panorama, each a 1-minute exposure at f/2.8 with a 15mm lens oriented in portrait mode, and using a Canon 6D at ISO 3200. There was no tracking – the camera was just on a tripod. Each segment is 45° apart. I used PTGui software to stitch the segments into one seamless scene. 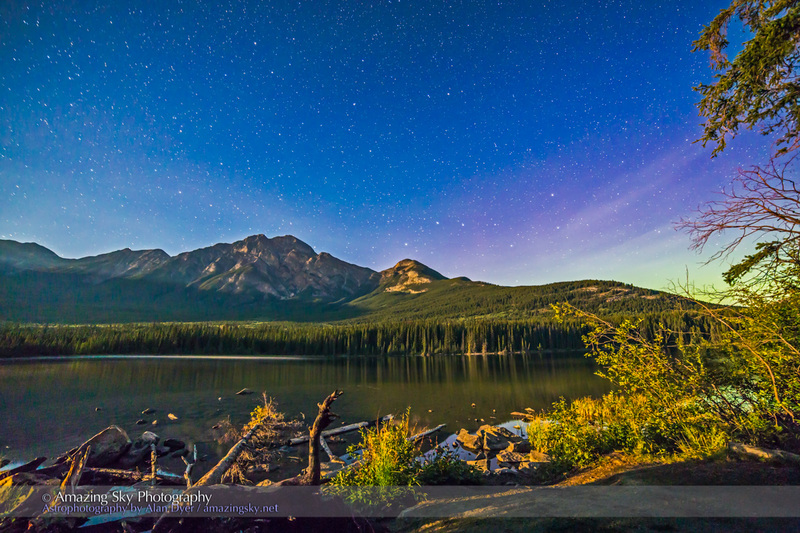 The sky presents a panoramic show from Pyramid Island in Jasper National Park. What a wonderful place to watch the stars. Last night I walked out to Pyramid Island in Jasper, via the historic boardwalk built in the 1930s. The site provides a panorama view around the lake and sky. To the left is the “mainland.” Just left of centre the waxing gibbous Moon is setting over Pyramid Lake. To the right of centre, the boardwalk leads out the small island, with Pyramid Mountain behind it. To the right of the frame, a faint aurora glows to the northeast over the still waters of the lake. This is a 360° panorama shot with the 15mm full-frame fish-eye lens in portrait orientation, with the segments stitched with PTGui software. After shooting some panoramas I walked to the end of the island and shot this view looking north and northwest to Pyramid Mountain. The Big Dipper is to the right of the peak, and the aurora lights up the northern horizon at right. As I shot these images, the night was absolutely quiet. Until the wolves began to howl at the north end of the lake, in mournful howls that echoed across the waters. It was one of the most spine-chilling moments I’ve experienced in many years of shooting landscapes at night. The northern lights dance, and light the pioneer homes at the old Larson Ranch in Grasslands National Park. What a night this was! I arrived at the Larson Ranch site in the Frenchman River valley to shoot some Milky Way panoramas, when, right on cue, the aurora broke loose. Some aurora had been there since nightfall as a diffuse arc, but about 11 p.m. local time (Central Standard Time in Saskatchewan) the curtains began to dance and pulse with activity as a sub-storm hit, raining solar particles onto our atmosphere from down the magnetic tail of the Earth. The aurora glow lit the old pioneer buildings of the Larson Ranch, one of the stops on the scenic backroad drive through the Park. The Larsons ran their ranch by the Frenchman, or Whitemud River, from the 1920s until 1985 when they sold their ranch to the National Park system, forming the first land for the new Grasslands National Park. The house at left is the original home of cowboy author Will James, who lived here for a time working on ranches in the valley before moving to the United States. He was from Quebec, where he was Ernest Dufault. I shot this 360° panorama using a 15mm lens, shooting 8 segments at 45° spacings, each a 1-minute exposure at ISO 2500 and f/3.2 with the Canon 6D. I used PTGui software to stitch the segments into a equi-rectangular projection pan.